Tierra Patagonia Hotel & Spa, located in Torres del Paine, Chile, has been ranked #1 in the Top 10 South American Resort Hotels in the 2018 Travel + Leisure World’s Best Awards, honoring the top travel destinations and companies around the globe as rated by its readers. The World’s Best Awards appear in the August 2018 issue of Travel + Leisure, on sale July 27, and online: https://www.travelandleisure.com/worlds-best. Tierra Patagonia has also been ranked #7 in the Top 100 Hotels Overall category. Tierra Patagonia Hotel & Spa is a 40-room resort on an enviable location on the banks of Lake Sarmiento on the edge of Torres del Paine National Park and UNESCO Biosphere. 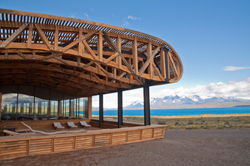 The property showcases the work of Chile’s leading architects and designers and invites guests to experience the sweeping vistas and dramatic beauty of the region in beautifully designed spaces with legendary Patagonian hospitality. The design of the hotel complements the pattern, flow and geology of this privileged location. Santiago-based architects, Cazu Zegers, who has focused on creating a definition of space that minimizes the impact on the site by integrating with the scenery and the natural elements of the wind, so characteristic of the region. Interior architecture is by renowned Chilean designers Alexandra Edwards and Carolina Delpiano, who also created the award-winning spaces at Tierra Atacama and Tierra Chiloé. Tierra Patagonia offers a wide range of excursions to experience one of the most majestic and breathtaking settings on earth. Excursions range from awe-inspiring treks to the undiscovered corners both in-and-out of the Torres del Paine National Park, boating across the glacial lakes, to horseback riding across the Patagonian steppe. In addition to a stunning location and design, Tierra Hotels chef creates Patagonia Cuisine, often sourced from nearby estancias. Wellness and pampering is central to the guest experience at Tierra Patagonia, with a full range of signature spa treatments at UMA spa, which features stunning views of the Torres del Paine and Lake Sarmiento from the heated, indoor pool. Tierra Patagonia offers a luxury all-inclusive guest program which includes ground transfers from the Punta Arenas or Puerto Natales airports, accommodations, all meals, daily excursions, open bar of house drinks and wines and the use of the spa facilities. Special rates are also available for children and teens, making Tierra Patagonia an excellent option for family vacations. Tierra Hotels is a unique family of luxury hotels and resorts set in exceptional locations created by the Purcell family, famous for their long-established reputation for offering fine hospitality at Ski Portillo, Chile. Tierra Hotels is distinguished for a guest experience that delivers legendary South American hospitality, tailored adventure and cultural experiences, innovative design and architecture inspired by the natural surroundings and environment. Tierra Hotels are luxury all-inclusive resorts, with rates including inspired cuisine and guided excursions that provide guests the opportunity to experience the nature and cultural amenities of the regions. Tierra Hotels other properties are the award-winning Tierra Atacama Hotel and Spa, located in San Pedro de Atacama – an oasis in the dramatic Chilean Altiplano and Tierra Chiloé Hotel and Spa, on the island of Chiloe off the cost of northern Patagonia. Tierra Atacama was ranked one of the top 10 resort hotels in Latin America in the 2018 Travel + Leisure World’s Best Awards.